This is a graphic organizer I created in order to help students organize their ACES written response. There is a spot for the teacher to type in the question they would like to pose to the students and then there are spaces provided for students to answer each part of ACES. 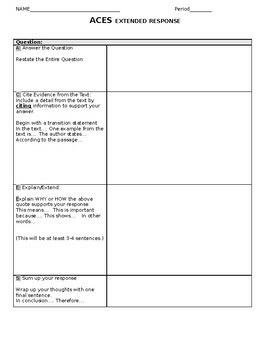 There are also sentence stems to help students get started with each part. **Note: I also have an ACES PowerPoint and rubric as well.